The IT industry has seen a dramatic rise in the adoption of cloud architecture. But despite this mass-migration, on-premise hardware remains a data center necessity for many companies. 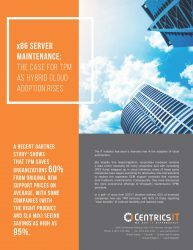 And with increasing OPEX funds wrapped up in cloud initiatives, many of these same companies have begun searching for alternative, low-cost solutions to replace the expensive OEM support contracts that maintain their hardware environments. Consequently, they have discovered the more economical offerings of third-party maintenance (TPM) providers. In a poll of more than 500 IT decision makers, 60% of surveyed companies now use TPM services, with 90% of those reporting “clear benefits” of contract flexibility and lowered costs. You know as well as we do that the price of all-new hardware, even with a new warranty, all but eliminates the hope of real savings. In this datasheet, we compare the yearly cost of maintenance for three major server OEMs and show the cost savings enabled by TPM. Download the datasheet today to unveil real budgetary savings and see for yourself why third-party maintenance is a cost-efficient alternative to the inflated prices of OEM maintenance offerings. average savings from original OEM support prices as reported by Gartner, with some savings as high as 95%. of 500 IT decision makers polled by Gartner reported “clear benefits” of contract flexibility and lowered costs from TPM.